This super-lightweight, easy-to-apply, velvety mousse delivers the ultra-even all-over tan youve always wanted. Infused with conditioning aloe vera and long-lasting colour, youll have a perfectly natural looking, streak-free tan that dries in an instant. 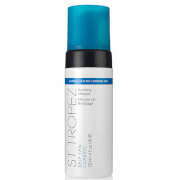 The St Tropez innovative Aromaguard™ fragrance technology eliminates the tell-tale self tan aroma by a minimum of 70% and instead gives a beautiful subtle, yet refreshing fragrance.